I'm a fairly greedy person, in case you are not aware. I love to receive gifts and I love to win prizes. This is why this will be one of my favorite recent posts! It's about things I've both received and won! Quite recently, I began to follow the blog Knitter in the Kitchen, mostly for her beautiful photography. She's not a frequent blogger, but then... neither am I. I must forgive this fault, or I am simply the pot to her kettle. Really, if you go to her site, you'll see that her photography more than makes up for her infrequent posts. However, I tend to follow craft blogs for their photography. A bit after I subscribed to her feed, she ran a nice post about her craft room that included a giveaway at the very end! I have recently stopped trying to win giveaways because they are often swamped with comments and I don't want to win something unless I really want it. I couldn't ignore this, however. First was the fact that her sewing area is the most gorgeously coordinated sewing area I've ever seen. I'd weep with joy to sew in her room every day. (Seriously, check her ironing board out. My own ironing board is a mini version with a stained white cloth cover.) Second was the fact that she decorated the room in orange, brown, and white with a lot of linen. I love a color combined with brown and white. If you know me in real life, you'll know that Nathan's room is primarily done in green, brown, and white, and my own bedroom is Tiffany blue, brown, and white. 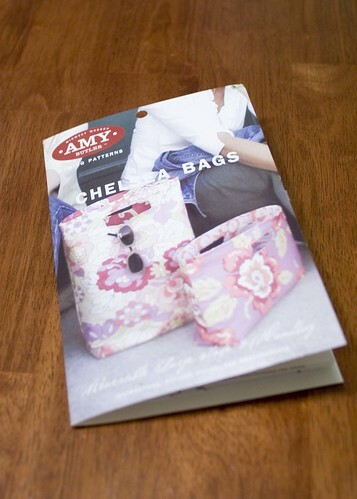 Lastly, she was giving away two Amy Butler patterns and she hadn't advertised the post as a giveaway, meaning it looked like I had a shot in hell of winning. So, I took a chance. AND WON! I now have my very first Amy Butler pattern and it's sitting on my pattern shelf silently intimidating me. See? There it is, going, "I need interfacing to work, Kitten." I have tried to shush it with the fact that I want to do eighteen hundred other projects first, and I don't have any fabric worthy of it, but it makes chicken sounds at me. Thank you, Knitter in the Kitchen. I hope I make something gorgeous. Next up? My birthday presents from Paul's parents. I say parents, but let's get real on who picked out these gifts. Thanks, mom! 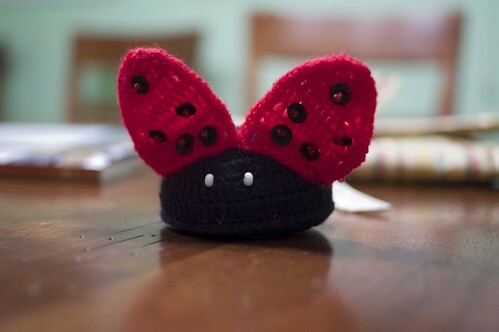 What you see there are Socks from the Toe Up by Wendy Johnson, a cute circular knitting needle holding case from Della Q, a tiny ladybug tape measure from Lantern Moon, and a gift certificate to Knitting to Know Ewe. My mother-in-law was super cute when she gave it to me and told me that she was now obsessed with Lantern Moon. A long time lover of their rosewood and ebony needles, I understood where she was coming from. She told me we would have to go together to spend the gift certificate, and I am happy to do so. I love going yarn shopping with people, and I imagine it'll be fun shopping with her for yarn. I would say that we would likely have nothing in common yarn-wise, but I have looked askance at Helen's purple yarn purchases, and Christy has called some of my yarn loves "unicorn puke colored", I believe. Just because you have a lot in common with someone doesn't mean that you'll have similar yarn colorway tastes! Someone help! My tape measure is attacking me! I love getting cute tape measures! How are all my readers doing? I see you all blogging about your crazy knitting, so I assume well. I'm still chugging along myself, and I expect I'll have some anklets to model for you all soon, as well as the start of Shalom. Helen, when do we get together? Ooh, I love that knitting blog you linked: I need a new sewing machine cover, my plastic one is ripping to shreds. POO. And YES, white, brown, ______ colorways are love. Tiffany blue is one of my favorite colors to put in with it, and orchid. Ooohhh - I love everything! Congrats! I'll have to check out the yarn store too! Darlings, I've Missed Sewing. And You.